Since joining our practice in 2000, Dr. Philippe Capraro has established himself as one of the Denver area’s finest and most proven plastic surgeons. His years of experience and flexible skill set mean he is equipped to perform a wide range of plastic surgery procedures. Dr. Capraro is recognized throughout the country for his work in both aesthetic and reconstructive procedures. He has published and lectured extensively on the subjects, and has even appeared on local television to share his medical knowledge with the people of the Denver area. If you’re a resident of Denver, Colorado, or if you’re a long-distance patient interested in the outstanding work of Dr. Capraro and our entire staff, please call Grossman | Capraro Plastic Surgery today at 303-320-5566. This training and education has allowed Dr. Capraro to become an invaluable member of the Grossman Plastic Surgery team. As a provider of cosmetic plastic surgery he has helped countless Denver-area patients achieve their aesthetic goals, while his knowledge of reconstructive surgery has allowed him to aid those who require surgical procedures after cancer or other ailments. 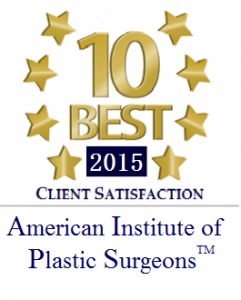 Dr. Capraro is certified by the American Board of Plastic Surgeons. This means he has passed a series of rigorous oral and written exams and demonstrated a commitment to keeping up with new developments and techniques in the field of plastic surgery. When choosing a Denver plastic surgeon, you should always look for a doctor who is board-certified in plastic surgery. This designation means you can trust in the surgeon’s skill and experience. In short, whether you’re looking for an aesthetic or reconstructive breast procedure, surgery after weight loss or facial plastic surgery, Dr. Capraro is equipped to help with the skill, dedication and passion for which he has become known. Sr. John’s College Military High School, Washington, D.C.
Director: John A. Grossman M.D. and Adrenergic Responses in Stress are Sexually Differentiated. Hammond DC, Bouwense, C L, B.A., B.S ,Hankins, WT, M.D. Maxewell-Davis, G.S. M.D., Furdyna, J. M.D., and Capraro, PA, M.D. Microsurgical Replantation of the Amputated Nose. Plast. and Reconstr. Surg. FMRI. Presented at the Plastic Surgery Senior Conference, Galveston, TX. Maxillofacial Surgery – Caracas, Venezuela, March 28, 2000. Caracas, Venezuela, March 29, 2000. Dr. Capraro performs a range of cosmetic and reconstructive procedures. He is an asset to our international patients, speaking Spanish, Italian and French.